We had booked at another hotel and were very disappointed. I went on booking the very next morning and found this gem of a resort which was a few minutes from the place we originally booked. Everything was perfect. The staff was friendly and helpful and the surroundings were relaxing. We got 15 minute free spa treatments. We decided to go ahead and splurge for hour long massages. We had hiked the Samarian Gorge so it was fitting. Our stay also came with breakfast which was a huge spread and looked like there was an all inclusive option as well. A great stay on our last day for a daughter mother trip. Tiny room,by the pool.noisy all day and noisy until early hours,should perhaps put all the late night drinkers in these rooms!Coffee and tea not replenished,breakfast ok,usual barging by people who cannot get food fast enough,didnt bother with breakfast second day.I was staying at apartments close by and decided to treat my wife with a spa break.looked to see if could book the wet rooms and pool,but told would have to book a 90 euro massage(each) if we wanted to use the facilities. The workers of the hotel were always smiling, very warm people. Excellent choice for calm and relaxing holiday! Facilities are good, newly renovated. Room was spacious and comfortable, very good mattress and a choice for pillow, to my surprise! Food was a surprise too! You can find a large variety of tasty and freshly cooked dishes, many traditional options to try. Service is excellent, the staff very helpful and polite, they always have a smile for you. Thank you for the wonderful stay, see you soon! The grounds and facilities were very nice. Plenty of choice for poolside loungers and/or seating. WiFi was very reliable too. Access to bus/taxi is easy. Great hotel, perfect for relaxing holiday! Food is excellent, many different things to taste. The a la carte restaurant is really good-Cretan breakfast is delicious. The hotel is very clean. Room was spacious and comfortable. Comfy mattress and pillow. The staff is amazing. They pay attention to the detail, they can make your stay in Lavris Hotels & Spa really special. Strongly recommended! We had a private pool! What else could you ask for. We didn't even go for the all inclusive option, just breakfast and dinner and it was more than enough food for us. The place was great, the staff super friendly. It's not right on the beach which might be an issue for some, but it's quite close (15min by foot, and there's a hotel shuttle that goes back and forth several times a day). The food was good, with lots of vegetarian options. Did I mention we had a private pool? There were several available to everyone at large, both out in the open and indoor, but our room was one of five that came with its own freaking pool; in fact we stayed in the room that's advertised among the pictures in the website, there's nothing hidden or a catch, it was exactly as pictured. We're going back for sure. Lavris restaurant offers great food for breakfast and dinner (included into our room rate). Rooms are large and convenient. Verty nice arrangement of rooms, pools and other buildings inside hotel's area. Everything was really fine, the hotel is clean, the staff is very nice and polite. Also we've asked for a room with a view to the sea and they granted it without question. Also the food was very delicious and diverse. Nice experience! COOEE Lavris Hotels & Spa This rating is a reflection of how the property compares to the industry standard when it comes to price, facilities and services available. It's based on a self-evaluation by the property. Use this rating to help choose your stay! COOEE Lavris Hotels & Spa offers newly furnished and constructed guestrooms with views to the sea, the garden or the swimming pool. The hotel has 170 bright and well furnished rooms featuring modern facilities, thus allowing a pleasant stay. Each has a TV with satellite channels, a mini fridge, and balcony. Guests can enjoy delicious Greek and International cuisine at the hotel's restaurant or a drink at the lively pool bar. Kato Gouves is a well-developed tourist resort with sandy beach coves, traditional villages and interesting archaeological sites. The village is conveniently located close to the Creta Aquarium, and the Diving Center, only 9.9 mi east of Heraklion International Airport and 4.3 mi from Hersonissos village. When would you like to stay at COOEE Lavris Hotels & Spa? 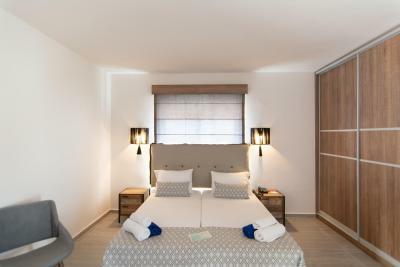 Overlooking the garden, the pool or the sea, this air-conditioned room is equipped with a mini fridge, a TV with satellite channels and a hairdryer. Connecting rooms are available on request (subject to availability). This air-conditioned family room opens to a balcony. It offers a satellite TV and a mini fridge. Free toiletries and a hairdryer are included. This triple room has a balcony, flat-screen TV and executive lounge access. Our hotel is ideal for travelers who are looking for tranquility, a warm welcoming atmosphere and easy access to all sightseeing of Crete. House Rules COOEE Lavris Hotels & Spa takes special requests – add in the next step! COOEE Lavris Hotels &amp; Spa accepts these cards and reserves the right to temporarily hold an amount prior to arrival. COOEE Lavris Hotels & Spa accepts these cards and reserves the right to temporarily hold an amount prior to arrival. Please inform COOEE Lavris Hotels & Spa of your expected arrival time in advance. You can use the Special Requests box when booking, or contact the property directly using the contact details in your confirmation. The area outside of the grounds is not a great neighborhood, but it doesn't take long (10-15 minutes) to walk to the beach area. I guess the weather? It could have been warmer but that's on us not the hotel. We'll be back during summer proper next time. Nothing , everything was perfect!